Third Row Standing: Fred Warren (Base drum) Joe Walker, G Gilbert, Alf Challands, Tom Langley,?,?,?,?,?,?,?,? 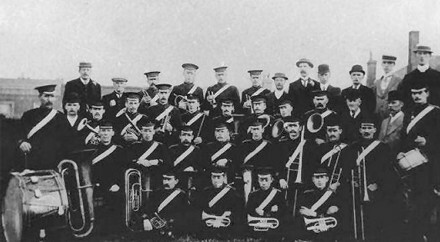 Fig.2 Codnor Old Volunteer Band photographed at Loscoe on the occasion of Queen Victoria’s Diamond Jubilee 1897. Back Row Left to Right: Fred Warren, Willis Brown, Wm Eyre (conductor), Hiram Eyre, Harry Eyre, John Wathey, Harold Langley, Wm Eyre, jun, Wm Abbott and Geo. Wadkinson. 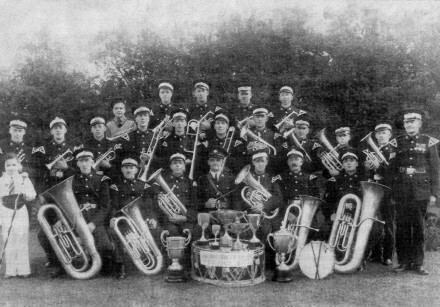 Fig.3 This is the Butterley Co. Ambulance Band pictured at Codnor Miners Welfare in 1938. Middle Row: Dennis Burgin, Harry Booth, Pat Spencer, Bill Watson, Ernie Ingtam, Tom Crossley, Dennis Langton, Lawrance Taylor, P Cresswell, Bill Mills,? The village of Codnor - famed chiefly for colliers and smoke, and a glaringly painted picture of Lord Byron, which adorns the principal alehouse in the place - was en fete. There was a brass band contest in the village, and an event of so alarming and extraordinary a character naturally operated very forcibly on the mining mind, and threw it into a state of agitation and unrest. The contest took place in a field some few minutes' walk from the village proper, and as the weather, in the early part of the day, was fine and promising, there was a pretty large attendance of spectators, the colliers mustering in strong force. In the afternoon black, ominous-looking clouds gathered overhead, and at length the rain came down in earnest, accompanied by thunder and lightning. The ground was cleared in a "brace of shakes", and it was some time before the contest could be resumed. Eight bands competed, and the prize money, amounting to £26, was divided into four prizes; the first £11, the second £7, the third £5, and the fourth £3 The competing bands were from Ruddington, Heanor, Chesterfield, Codnor, Normanton, Sutton-in-Ashfield, Hathern, and Clay Cross, and they occupied the platform successively in the above order. It was arranged that each band should play two pieces - "Gloria" in Mozart's 12th Mass first; the second piece whatever ever each band thought well. The "Gloria" was played very creditably by most of the bands, and each was separately applauded, the Sutton-in-Ashfield band being the general favourite. After going through the first piece there was an interval of about half an hour, and then the contest was renewed. The Sutton band again fell in for a large share of applause, after playing a lengthy selection - "Il Flauto Magico" with much taste and skill. 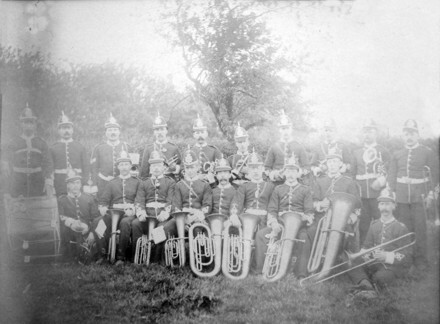 The Codnor band was likewise much cheered after finishing a long and somewhat tedious selection, but this band was not fortunate enough to secure a "place". At the conclusion of the contest, shortly before seven o'clock, Mr. King of Derby, one of the judges, ascended the platform and read out the following decision: 1st prize (£11) Sutton-in-Ashfield; 2nd (£7), Heanor; 3rd (£5), Clay Cross; 4th (£3), Chesterfield. The other judge was Mr. McCarthy, also of Derby, and the awards seemed to give general satisfaction.